I am writing to you because I feel that I have to tell you about one of the most spectacular, unexpected and emotional birding experiences of my life. Many times, throughout my life-long interest in wildlife, I have been astonished, captivated, perplexed, or simply awestruck at what the natural world has to offer. Seeing hundreds of thousands of Starlings murmurating against a fiery sunset over the Somerset Levels has been a longstanding favourite of mine. So has the sight and sounds of skies filled with waders escaping the incoming tide during the Snettisham Spectacular. Recently, my wife, Judy, and I witnessed something quite unanticipated which rivalled and even surpassed these amazing phenomena. Probably, a once in a lifetime experience for us! For many years we had wanted to tour Cuba, but the island had never quite reached the top of our next-place-to-visit list. Probably because several friends, who had visited the island previously, related worrying accounts of the vagaries of Cuba’s internal travel arrangements. Our opportunity to see the island arose when Judy spotted an advertisement for an October cruise that, more or less, circumnavigated Cuba with interesting ports of call en route. Yes, I know what you are wondering. Firstly, why would anybody venture to the Caribbean during hurricane season and secondly, what are wildlife enthusiasts (and volunteers to boot, I might add) thinking about booking a cruise holiday. I must admit, I did have pangs of guilt about the environmental credentials of cruising. However, as you will discover, the overall environmental impact of the cruise wasn’t anything like it might have been. After embarking the ship in Nassau we set sail for our first destination of Santiago de Cuba. With binoculars in hand, we found a shady position on deck and scanned the ocean in the hope of spotting seabirds and perhaps the odd cetacean. No whales or dolphins, but plenty of Laughing Gulls, the occasional Brown Booby and a Frigate Bird. As is often the case when we go on holiday, being the only binocular and camera bearing couple we stood out amongst our fellow guests. Consequently, in no time at all, the ship’s incredibly enthusiastic ornithologist spotted us and introduced himself. 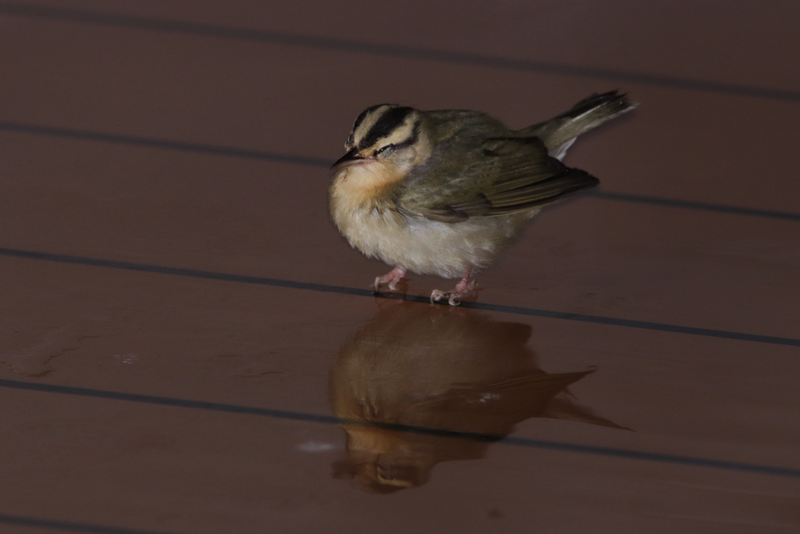 As we chatted he casually mentioned that sometimes migrating birds will alight and rest on the ship as it crosses the open sea, particularly at night, or during poor weather conditions. He went on to say that every night, at about 04:00 hrs, during the autumn migration of North American birds to Central America, he patrolled the ship on the lookout for any birds hitching a ride. To Judy’s alarm, he offered to call us if anything interesting turned up during his nocturnal birding. I accepted his kind offer out of enthusiasm, as did Judy, but in her case probably more out of politeness. Sea conditions remained calm, but we kept a close eye on a weather system developing to the south west of our position that was forecast to track through the seas around the western tip of Cuba. Slightly disturbingly, so were we. 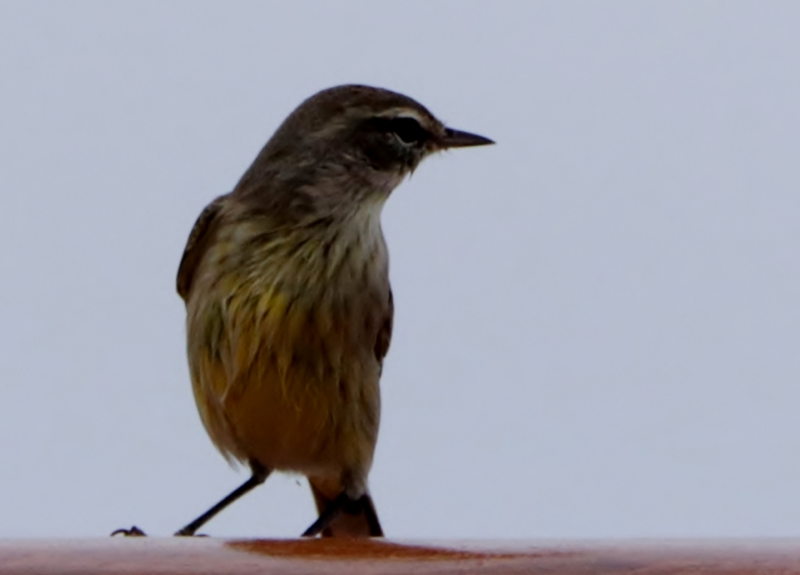 True to his word, our cabin telephone rang at 04:20 hrs that night and our cheery ornithologist informed us that there were a few warblers on deck. We quickly dressed and made our way up to the pool-deck. The deck was in semi-darkness and deserted apart from the ornithologist. 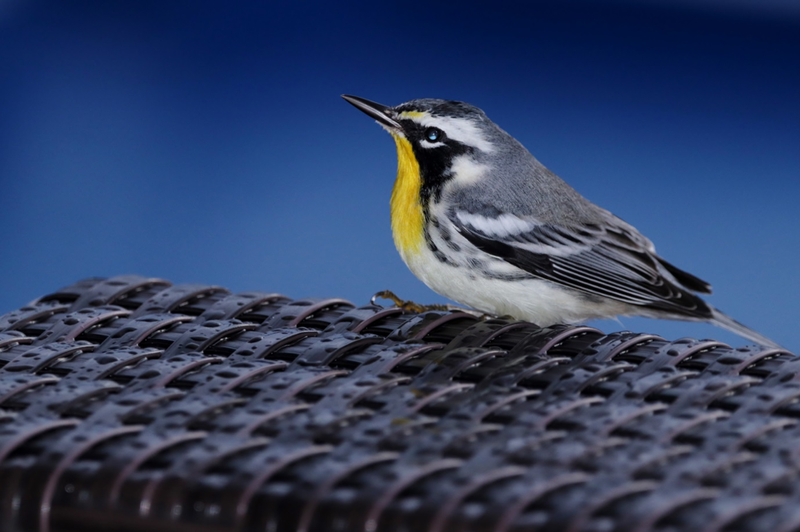 He enthusiastically beckoned us to accompany him on a lap of the deck to point out the handful of American warblers he had spotted. We were pleased to see one or two Northern Parulas, American Redstarts and Prairie Warblers roosting on unlikely perches such as sunbeds and barstools. 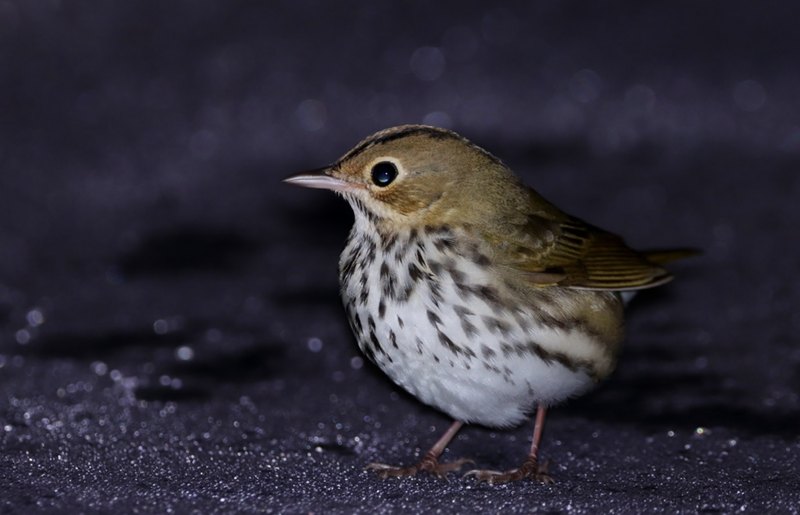 There was even an Ovenbird perched, where else, but on the burger-bar oven. 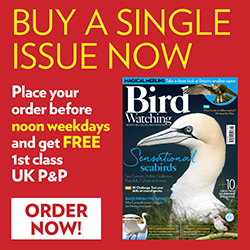 We considered ourselves to be fortunate to see these migrating birds and were particularly taken by how closely we could approach without disturbing them. The birds must have recovered enough to continue their flight by daybreak and we last saw them heading off southwards. Our excursion to Santiago de Cuba and brief sampling of its culture, buildings and role in the Cuban revolution surpassed expectations. Unfortunately, the weather did not as it deteriorated into torrential downpours and gales. Meanwhile the developing weather system to the south-west did not abate and had been classified as a tropical storm. The tropical storm ultimately energised itself to become Hurricane Michael and we were feeling its early, wide-reaching effects. The cruise continued its anticlockwise circumnavigation of the island as it headed for Havana through very choppy seas. Encouraged by our previous early morning American warbler sightings, I decided to set my alarm for 04:00hrs and join the ornithologist on his next deck tour. When the alarm went off, the ship was slowly swaying from side-to-side and I could hear the rain lashing against the cabin’s balcony doors. My instinct was to roll over and go back to sleep. Judy unhesitatingly took that option, but I decided to brave the conditions and made my way up to the pool deck. When I pushed open the heavy doors leading to the deck I was utterly astounded by what I saw. The ship’s decks, railings, lifeboats, sunbeds and all other available surfaces were adorned by hundreds of exhausted birds. Not just warblers, but various species of Vireo, Tanager, Grosbeak, Thrush and even a Green Heron and Yellow-billed Cuckoo. This was only part of the spectacle though. 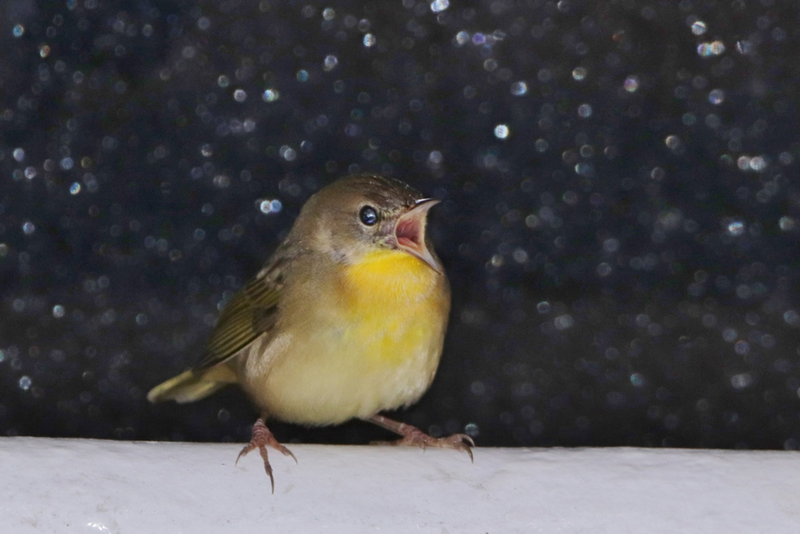 The vessel’s lights illuminated the air above the ship to reveal the sight of thousands of small birds desperately struggling to fly in the wind and rain. Some maintained their position above the ship, constantly calling, whilst others continued to land wherever they could. The sight and sound was spectacular! This was too incredible for Judy to miss and after making an excitedly garbled phone call to her she joined me on deck. Needless to say she was equally aghast. I recall her words when she looked up to see the massive flock above us. Her description of what we were seeing as ‘a blizzard of birds’ was perfect. As we carefully made our way around the deck trying to identify how many different species of bird had alighted on the ship, a flock of Egrets flew above us for a short while, looking rather ghostly in the gloom. In that same murkiness we could hear a Green Heron calling as it kept pace with the ship. 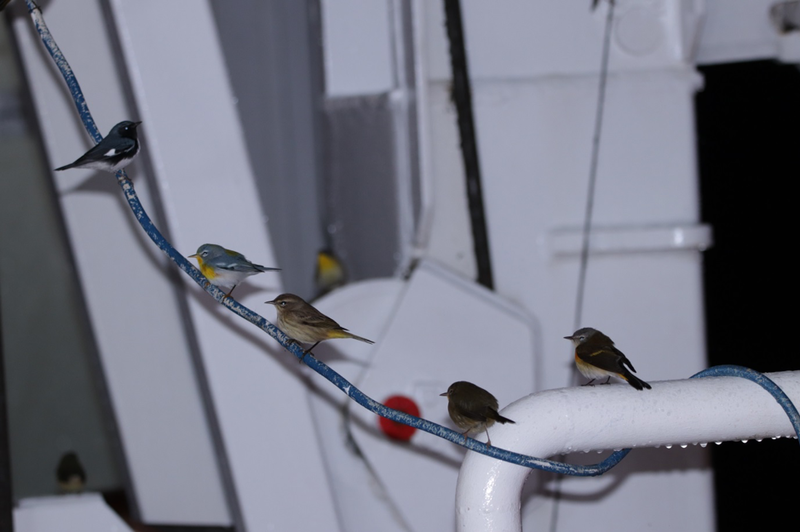 With much help from our ornithologist we identified twenty three species of birds resting on the ship. The birds on deck made little or no effort to move out of our way. Some simply sat on the deck, eyes closed, fast asleep. Seeing five or six different warbler species all perched on the same metre-long light cable seemed unreal. It was, however, about this point that the reality of what was happening began to sink in. 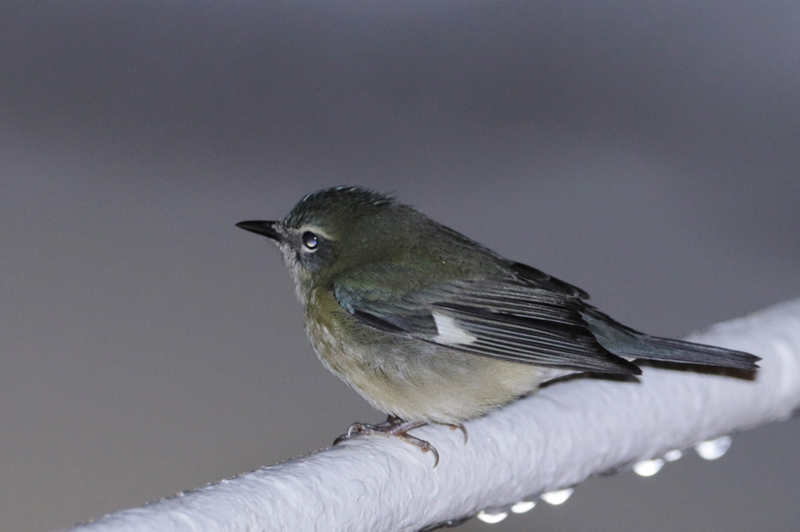 The ghastly weather had exhausted these migrating birds as they tried to cross the hundred mile stretch of sea between the Florida Keys and Cuba. The ship was providing refuge and I am in no doubt that its presence was saving the lives of countless birds. As we continued to walk around the deck we spotted a few tiny corpses of birds that hadn’t quite made it. Perhaps some had collided with the ship’s superstructure, but we did see one Northern Parula literally flutter to the deck and die in front of our very eyes, for no apparent reason other than it was probably beyond exhaustion. Heartbreaking! We knew that as daylight approached members of the crew would start to undertake various duties on the pool deck, including hosing-down. We encouraged birds we found resting in potentially vulnerable positions to move out of harm’s way. Judy picked up a Common Yellowthroat that was reluctant to move. On opening her hand to release the bird it merely perched on her finger tips and calmly sat there for almost ten minutes. As the crew moved about the deck carrying out early morning tasks they inadvertently activated the automatic doors leading to the ship’s interior. In no time at all birds started to enter one of the ship’s lounges. 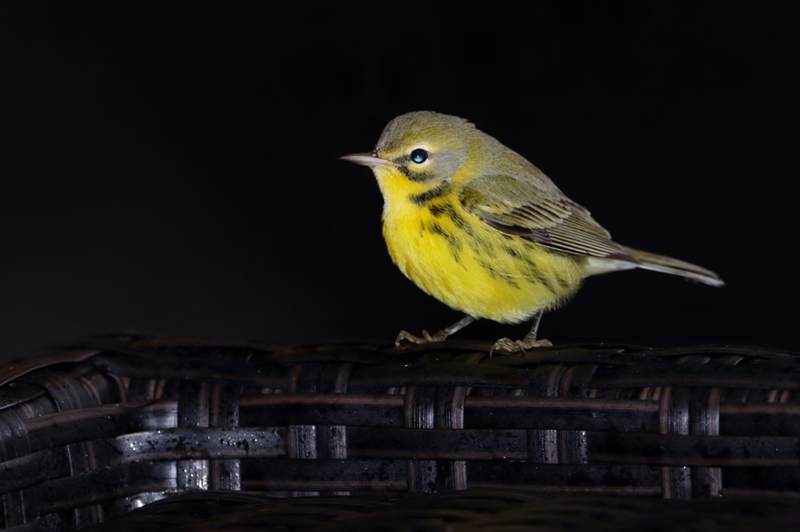 The situation became even more surreal when, amongst others, Worm-eating Warblers, Yellow-throated Warblers and Northern Parulas used lounge furniture and table decorations as makeshift perches. Fortunately, our ornithologist always travels with a child’s small fishing net on a cane. Why wouldn’t you? This proved an extremely effective means of trapping the birds before returning them to the relative freedom of the deck. Dawn had broken by the time the last bird was released from the lounge and the rain had almost stopped. 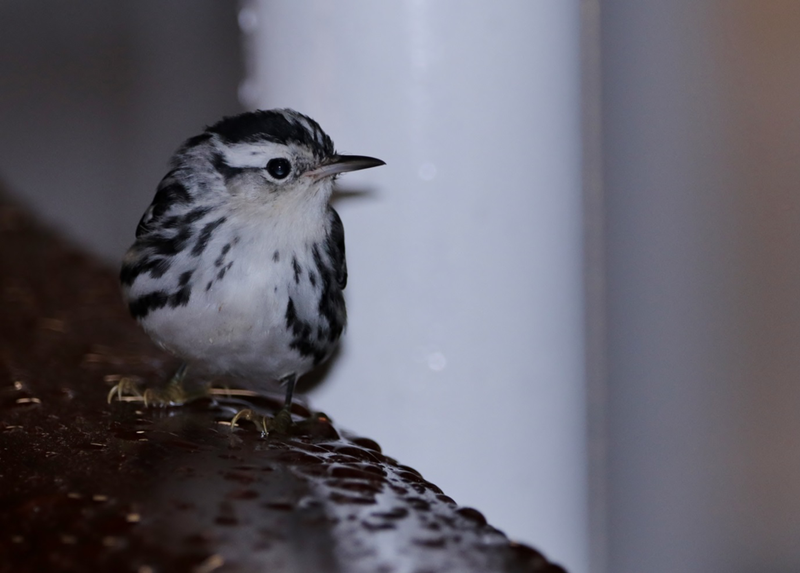 To our amazement, the recovering mass of birds on deck had, in a few hours, regained sufficient strength to leave the ship and fly the last few miles to the Cuban coast. Only a handful of birds remained on board by the time our fellow travellers started to emerge for breakfast. One observant passenger spotted a lone American Redstart sheltering under a wicker table and excitedly called her friends across to see this stunning bird. Little did she know what a truly amazing spectacle she and her other sleeping shipmates, had missed. The experience made Judy and I appreciate more than ever, just how incredible bird migration is. I still can’t understand how these tiny, beautiful creatures can face seemingly impossible odds and survive. It’s distressing to think how many birds might have succumbed to the foul weather and drowned that night, but at least on this occasion, I am convinced that a cruise ship played a part in saving the lives of hundreds, if not thousands of migrating birds.